Proof coins are the collectible version of popular bullion coin programs. 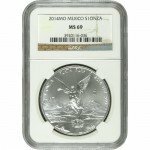 Many of the world’s most popular bullion coins are also produced by mints and refineries in proof versions for collectors who appreciate beauty in design, as well as purity of content. 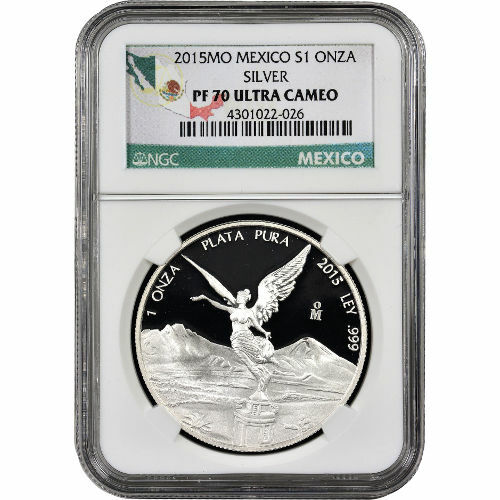 The 2015 1 oz Proof Silver Mexican Libertad Coin is currently available on Silver.com in perfect condition. 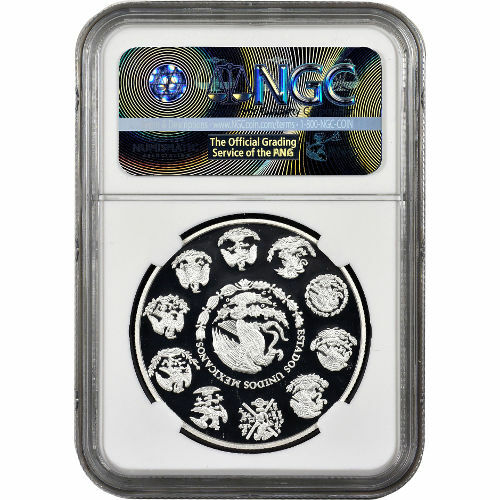 The NGC issued this grade to just 358 coins! 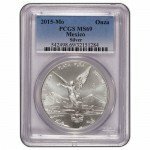 Consists of one troy ounce (1 onza) of .999 fine silver. Bears a grade of PF70 from the NGC. Features design inspiration from a historic Mexican coin. In 1920, the Mexican Mint introduced a gold Centenario coin as part of the nation’s centennial celebration of the War of Independence with Spain. On the obverse face was the front-facing image of the Angel of Independence. On the reverse, the Mexican coat of arms. Today that imagery lives on, in modern form, on the Silver Mexican Libertad coin. Proof Silver Mexican Libertads were first introduced for regular production in 1986, with just a one ounce weight available. In 1992 it expanded to feature four fractional-weight coins, and further expanded in 1996 to include a 2 ounce and 5 ounce variety. 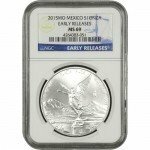 Each 2015 1 oz Proof Silver Mexican Libertad offered here is a perfect specimen according to the NGC. PF70 coins have their full, original luster and no detracting flaws of any kind. The design set on these coins appears to float above the background field courtesy of contrasting strong, frosted finishes (design) and deeply-mirrored, clear fields (background). This is known as an ultra-cameo finish. On the obverse face you’ll find the Angel of Independence as she is depicted in the center of Mexico City on the winged Victoria of Mexican Independence Victory Column. The reverse features the modern coat of arms for Mexico, as well as 10 historic depictions of the seal. The Mexican Mint was founded by Spanish conquistadors in 1535, making it the oldest operating facility in the Western Hemisphere today. It is owned by the federal government and controlled by Banco de Mexico. If you have questions, please contact Silver.com on the phone at 888-989-7223. We’re also available online using our live chat feature or by submitting your questions via email.